Perhaps our most popular attraction is our service. We assemble and set most of the jewelry in our store and are well prepared to handle most any special request for creating, altering or repairing virtually any piece of jewelry. Of course the biggest factor in our success is the trust placed in us by our customers. Our repair services are an excellent example of this trust. Each day people leave their prized possessions with us for services which include sizing, repair, engraving and watch repair. We are able to do in-house gold work as our skilled goldsmiths possess many diverse talents. If you own fine jewelry, it is really important to clearly understand your insurance options. We can help guide you through the insurance process as well as provide jewelry appraisals which are required to obtain insurance coverage. 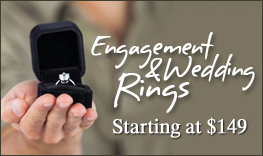 We provide appraisals free of charge for jewelry purchased from our stores and have an Independent American Gem Society Certified Appraiser to assist you with your other appraisal needs. Get pre-approved and enjoy greater purchasing power! Visit Kiess to complete a credit application today or Print Out An Application & Bring it in Store.